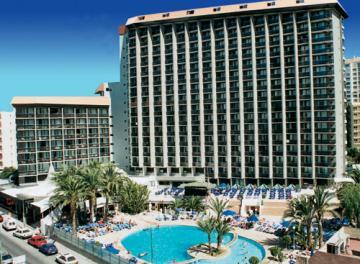 The Hotel Marina is located 250 yards from the beach only 500 yards from the centre of Benidorm. The hotel has a swimming pool for adults with a separate zone for children, terrace solarium to enjoy the sun. In the hotel, guests have access to a sauna, optional gymnasium and massage. Restaurant buffet, bar hall - lounge bar, cafeteria, snack bar, terrace solarium, sauna and gymnasium, children's playground.